Sun City West is a 16,900-home community 2.5 miles west of the original Sun City Arizona. Del Webb constructed the community between 1978 and 1997 and it is favored by home buyers who want reasonably priced homes in a large amenity-laden active adult golf course community. After the completion of the incredibly popular Sun City Arizona community in 1978, Del Webb Corporation purchased a large tract of land to the northwest and began construction on Sun City West. The newer community incorporates many of the same popular active adult attractions as Sun City, but on a slightly smaller scale. With the knowledge the Del Webb Corporation gained on the original community, they were able to design a community that matched the needs for an evolving retirement population. This active adult community includes the perfect mix of amenities and activities that cater to active adults who want to stay physically and socially active. The community was designed to intertwine with a variety of retail stores and shopping centers. Most residents find that all of their shopping needs can be accomplished via the golf-cart-legal streets. Within the community, residents have convenient access to supermarkets, pharmacies, banks, restaurants, post offices, churches and Del E. Webb Hospital. This 55+ community includes an enviable lineup of amenities that includes four recreation centers, nine golf courses and nine restaurants. The recreation centers house a variety of attractions such as indoor and outdoor pools, state-of-the-art fitness centers, indoor and outdoor walking tracks, ballrooms, dance studios, hobby and craft rooms, computer lab, Stardust Theater, concert hall and library. The grounds are adorned with amenities that beckon for residents to come out and enjoy the Arizona sunshine. Numerous tennis, bocce ball, pickleball and shuffleboard courts are dotted throughout the community. Additionally, the community has a softball field, lawn bowling rinks, volleyball and basketball courts, walking trails, garden plots and dog parks. There are a wide variety of housing styles to match the preferences and budgets of almost any buyer. Throughout the 19-year construction of the community there were over 140 different models offered. Homebuyers can select from single-family homes or attached homes. The single-family homes range in size from 800 to over 4,600 square feet. Attached homes include a variety of ranch villas and apartment-style flats that range from about 760 to 1,880 square feet. As expected, some of the homes in the community that were built in the early years tend to show their age. More recently, however, many homes have been updated or remodeled with more modern floor plan layouts and desirable finishes. Buyers in the community are most attracted to the affordability of the homes. It is an ideal community for buyers who prefer price and location over new construction. There are over 100 chartered clubs and interest groups represented in this 55+ community. Regardless of your passion, you are likely to find other like-minded residents who share similar interests. In addition to the many clubs and interest groups, the community hosts an exciting lineup of fun activities that include fitness classes, continuing education classes, parties and organized trips to area attractions. The majority of the community is unincorporated and without schools. As a result, residents enjoy some of the lowest property taxes in the nation. Plus, a large volunteer organization in the community helps maintain the grounds, organize events, teach classes and staff community buildings. The incredible volunteerism in the community helps keep the yearly association fees to a reasonable low cost. Sun City West is situated 19 miles northwest of downtown Phoenix in Arizona. Within nine miles, residents can enjoy the Arrowhead Mall, Challenger Space Center, West Valley Art Museum, Wildlife World Zoo, Arizona State University-West, Rio Salado College and Lake Pleasant. Plus, sports enthusiasts will enjoy the proximity to sporting venues hosting local teams such as the Cardinals (NFL), Coyotes (NHL) and several Major League Baseball spring training camps. 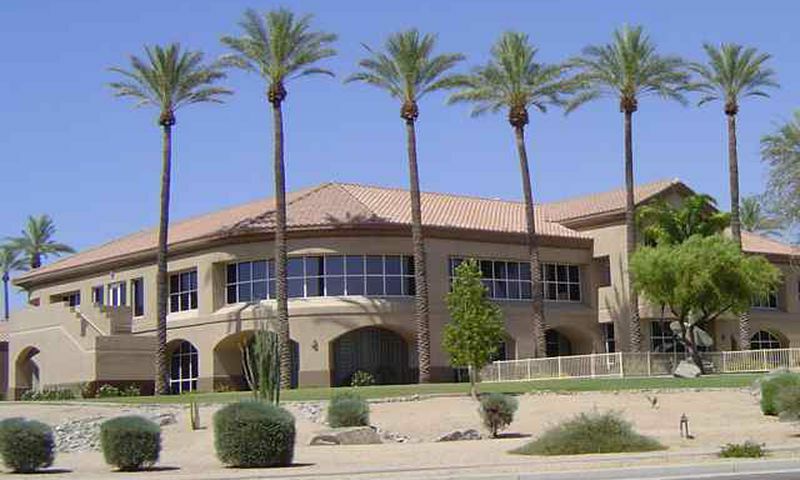 Residents of Sun City West enjoy access to resort-style amenities and recreation center. In addition to these, there are everyday conveniences located within Sun City West. Beardsley Recreation Center is located at 12755 Beardsley Road. Kuentz Recreation Center is located at 14401 R.H. Johnson Boulevard. Palm Ridge Recreation Center is located at 13800 W. Deer Valley Drive. The R.H. Johnson Recreation Center is located at 19803 R. H. Johnson Boulevard. There are plenty of activities available in Sun City West. Here is a sample of some of the clubs, activities and classes offered here. Patio Homes are attached homes that offer between 761 and 1,407 square feet of living space. These homes feature one to two bedrooms, one to two bathrooms, and a one to two-car garage. Please note: Due to the age of this community, some patio home floor plans may be missing. The Vacation Apartments in Sun City West are attached apartment-style flats. With approximately 948 to 1,042 square feet these residences offer one bedroom and one bathroom. Please note: Due to the age of this community, some vacation apartment floor plans may be missing. Patio Apartments are attached apartment-style flats. These residences offer approximately 1,392 to 1,651 square feet of living space with two bedrooms, two bathrooms, and an attached two-car garage. Please note: Due to the age of this community, some patio apartment floor plans may be missing. There were many attached duplex homes built in Sun City throughout the years. These homes offer about 1,164 to 1,882 square feet of living space with two bedrooms and two bathrooms. Please note: Due to the age of this community, some duplex floor plans may be missing. The H Series features single-family homes. Single-family homes range from 800 to 4,651 square feet. They come in a variety of sizes between one to three bedrooms, one to three bathrooms, and one to two-and-a-half car garages. Please note: Due to the age of this community, some H Series floor plans may be missing. The C Series (also known as "Casitas") single-family homes that range from approximately 1,102 to 1,390 square feet. This collection offers two bedrooms, two bathrooms, and an attached garage. Please note: Due to the age of this community, some C Series floor plans may be missing. The P Series features single-family homes that are between 1,183 and 2,705 square feet in size. Most homes offer two to three bedrooms, two to three bathrooms, and an attached garage. Please note: Due to the age of this community, some P Series floor plans may be missing. The S Series features single-family homes that range from 1,320 to 2,859 square feet in size. These homes offer two or three bedrooms, two or three bathrooms, and an attached two or two-and-a-half car garage. Please note: Due to the age of this community, some S Series floor plans may be missing. The T Series collection includes single-family homes that offer 1,493 to 1,748 square feet of living space. These homes have two bedrooms, two bathrooms, and an attached two-car garage. Please note: Due to the age of this community, some T Series floor plans may be missing. The V Series offers single family homes that range from 1,425 to 1,975 square feet in size. These homes offer two bedrooms, two bathrooms, an an attached two-car garage. Please note: Due to the age of this community, some V Series floor plans may be missing. The E Series features larger single-family homes with 2,497 to 2,903 square feet of living space. These homes offer two bedrooms, two or two-and-a-half bathrooms, and an attached garage. Some homes include dens as well. Please note: Due to the age of this community, some E Series floor plans may be missing. Great home prices, great neighbors, everything to do if you want to. Bought in March 2014 for seasonal use! Have been back 5 times since and absolutely live it! There is always something going on or to do even in the off season! People are so friendly here! It really is was of the nicest things that we have ever done for ourselves. Groceries, restaurants, gas, rec centers, pharmacies, Starbucks, hospital are just a few blocks away! We moved here from Wisconsin and are enjoying our new lives thoroughly! Everyone is so friendly and there are so many things to do. Walking, swimming and biking for starters. Free movies in the park (and soon at the pool, too) were a lot of fun last month. Over 100 clubs to try and think about joining. I moved in to Sun City West in 1995 after my kids encouraged me to downsize from our large family home. My husband had passed a few years prior and it was a difficult decision. Looking back it was the best decision for me and I am very happy with the friendships I've made here. I've had so many opportunities to travel and experience things I never dreamed of. I love the craft clubs and have even started making some money selling my pieces. I feel like part of a family here and that has meant the world to me. We spent the day with Jay today and he is a great agent. Listens,helps and is so personable. A pleasure to wrk with. 55places.com is not affiliated with the developer(s) or homeowners association of Sun City West. The information you submit is distributed to a 55places.com Partner Agent, who is a licensed real estate agent. The information regarding Sun City West has not been verified or approved by the developer or homeowners association. Please verify all information prior to purchasing. 55places.com is not responsible for any errors regarding the information displayed on this website.